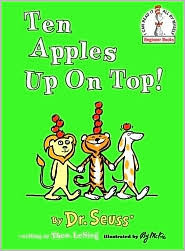 We read Ten Apples Up On Top!, by Dr. Seuss. This is a funny story about three friends that balance apples on their heads and will do anything to keep them there! This is one of Emily's favorite books at the moment. I thought it would be fun to make a picture of Emily with ten apples up on top. Emily painted the backround of her picture with watercolors. Emily glued a picture of herself onto the painting. Emily added circle "apple" stickers on top of a picture of herself. Ten Apples on Top of Emily! So cute! It really helps them relate better to the story line. My Pumpkin read this book as well. And also likes it. That was on my list of projects to do, but we never got it done. I'm so glad you did it. This is the cutest idea! I need to go and get that book now. I am definitely putting this on my to-do list. What a cute idea to incorporate your child right into the story. Wonderful Job! I love your idea! She did a great job too!! Loving this idea! We will have to try this! great job emily! That is so cute! Great idea. I'm sorry we haven't linked up. We are so busy with the beginning of the school year and the soccer season. I have a bunch of ideas so hopefully we will get to them soon! This is sooooo cute! We love this story and I know Eli would LOVE doing this project. How adorable! I love Ten Apples Up on Top and the artwork--just wonderful! I've seen similar projects before, heck I even did one in my K class but I LOVE the addition of your daughter's sweet little picture. Great book and great 1:1 correspondence activity. Love stART, by the way what a clever name you picked too! I love this idea! We'll be participating this week! This is great project - I haven't read Ten Apples on Top with the younger kids yet - thanks for bringing it back to mind. We linked in a little late, and sort of as an afterthought - but hope to better next time! Love this project! We did it today after nap time. I have to say I love your site. I am a mom of two girls that works full time outside the home. Whenever I want to do an art project with the girls, I go to your site first. If you have not already considered it, you should publish a book of all these great crafts. Looking forward to more. THANK YOU!